The little things, like Kennex picking up some used gum to chew and use as an adhesive, or Dorian turning on an Elton John song, that keep me interested in where Almost Human is building toward. Right now this is a show with two actors I find entertaining in the middle of Blade Runner: The Procedural still figuring out how to create refreshing cases. But as Karl Urban and Michael Ealy show they’ve got the right chemistry for a great buddy cop partnership, J.H. Wyman and his writing staff keep adding technological touches that make me intrigued by the world. Even in the midst of a fairly standard hostage and heist plot, those details are enough to keep me invested in the relationship between humanity and technology, and the consequences of uncontrollable innovation. One of the most obvious signs of rookie screenwriting is opening with a shot of an alarm clock to start the day. “Are You Receiving?” commits exactly that faux pas. But this is early on in the series, and I’m willing to begrudgingly admit that a familiar structuring technique helps show Kennex satisfied with being a miserable loner. And though the olive oil touch is a nice callback to the pilot (and an expected one), the most important implication is that Dorian has made an impression on Kennex, to the point where he’s willing to act like a partner instead of the human overseeing an android. That’s not to say that all of that early information couldn’t simply be divulged either without the alarm clock shot or the getting ready scene entirely, and skipping straight to Dorian smelling olive oil in the car on the way to work. But it took one of my screenwriting pet peeves and quickly moved away from verboten territory. 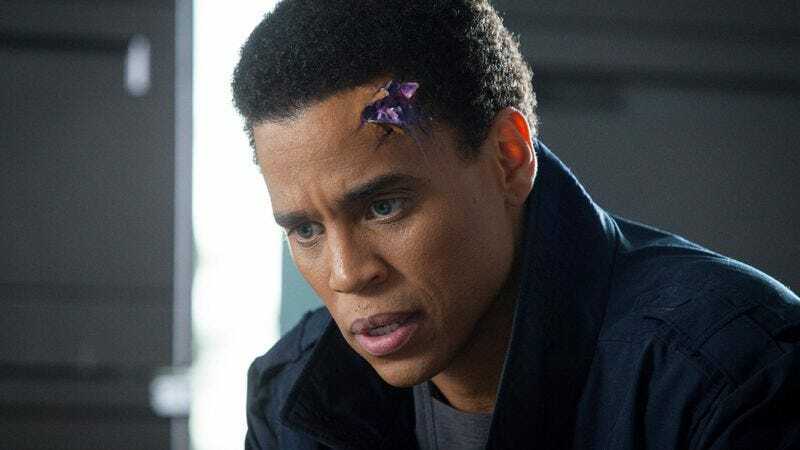 For the second episode in a row, Almost Human makes the wise decision to shy away from the overarching mystery established in the pilot in favor of laying groundwork on the partnership between Kennex and Dorian. This time, they’re the closest responding unit to a homicide at an office building, where a group of terrorists have holed up with a bunch of hostages on the 25th floor. The criminal group sets off a large explosion in the building and disables the elevators, leaving Kennex and Dorian as the only two people attempting to do anything inside the building. Captain Maldonado runs the hostage negotiations from headquarters, but it’s basically a stall tactic for the showdown between the detectives and the terrorists. Only they’re not actually terrorists. And this is where the technology starts to shine, giving the Almost Human writers more chances to think up cool gadgets that help speed the case along, but don’t actually do the solving for the detectives. Dorian pulls up the archived surveillance footage, and transmits the ringleader’s face for identification. He imitates different voices on the phone of a few people trying to make emergency calls out of the building, and then transfers an informative call—a woman hiding in a supply closet watching the hostage situation—to Kennex’s ear, and he just talks along a though it’s a simple transferred call. And once the detective encounter their first terrorists on a lower floor, they find out that the men are wearing “facemakers” to alter their appearance, making them look like a terrorist organization in search of a fission detonator, for use on a large-scale weapon. But the face-changing tech plants the seed of doubt that the big terrorist show is a diversion. All of those plot machinations are typical for a police procedural, progressing through the hostage crisis with expected steps, right down to the criminals basically giggling with delight that the police are following every step according to plan. With shows that recycle crime plots, what have to stand out are the details and character bits around the predictable parts. Then it’s a good thing that Urban and Ealy keep going back and forth with witty banter, and that valuable companionship and loyalty is starting to wear Kennex down to the point where he actually gives a damn about Dorian’s life (insofar that it helps solve a case). When Dorian takes a bullet ricochet to the head, he’s slowly losing all helpful functions, so Kennex whips up a makeshift patch to keep Dorian running. It’s disgusting, but it’s progress in the main human/robot relationship. The end of the plot is a foregone conclusion once Kennex and Dorian start moving up the stairs, but it’s still a nice twist that the episode had one final move up its sleeve, pivoting from terrorist hostage crisis to secret heist before Dorian puts his own life (Er, existence?) at risk to bring the hostages to safety. That earns him a gun pointed right between his eyes, and it’s only a reckless and facemaker-toting Kennex who ends it all. I don’t want episodes like this all the time, since right now it not only put Lily Taylor on the outs, but Mackenzie Crook as well. And then there’s the message of the episode. I’m a bit afraid that Almost Human will always be searching for the philosophical ending to tie humans and robots together, trying valiantly to wring new digital age insight to a show that can get by on being slick and entertaining while slowly filling in characters. But at the same time, I like that a major network show is now raising these types of probing genre fiction-based questions again. Fringe is gone but never forgotten. Even that somewhat deflating post-rescue scene, as Kennex converses with the woman on the phone and her sister, gives way to a message-heavy final interaction, as Dorian muses on fearing death while looking down the barrel of a gun. Kennex’s words of wisdom: “Dead is dead.” Both of these detectives seem to have accepted that they no longer wish to be alone in the world, which the first step toward caring about someone else. And a more compassionate and funny Kennex would certainly be a good thing, and not just for a witty sparring partner with Dorian. It should help Urban demonstrate more range in his performance, which still rests firmly within gruff cop parameters. Palladium is the element that was poisoning Tony Stark in Iron Man 2, which is a film I will admit to enjoying far more than its crummy reputation suggests. That whole tic where the terrorist leader asks people for their name because he doesn't kill someone he doesn’t know is a tired trope and I would like to see it go away. It doesn’t project honor or politeness in the way it’s meant to. I wish all the big action scenes didn’t come prepackaged with loud techno music.